This all-terrain, stainless steel griddle and lid set works in ovens, over stovetops, even on grills—and its durable build is Made for a Lifetime. We like how versatile this cooking tool is. You can braise meat or fish to perfection in minutes. Or cook up a pizza. Or bake a delicious dessert. The heavyweight base retains heat while the lid captures it, so you can grill, smoke, steam, or bake indoors or out. 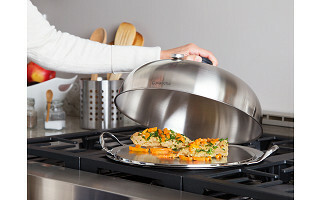 From stove to table top, the Mastrad O’Plancha shows careful attention to detail. The ridges at the edge of the plate collect excess cooking juices, the rimless design makes it easy to turn food over on the surface, and the lid will keep food warm until it’s served. There’s even a built-in thermometer to keep tabs on the temperature inside. Rugged yet versatile, Mastrad O’Plancha will help you cook (and serve) almost anything. Hello everyone! I'm proud to introduce Mastrad O'Plancha to The Grommet. I'd be happy to answer any questions you have! Can it be used on induction type heating elements? Thanks for your question. Yes the O'Plancha has been the rage in Europe where induction cooking has been used for years. So use it on your induction element with confidence! Is the lid detachable? Also, in the video it seems it would be necessary to collect the juices while cooking, is this necessary? Or will the reservoir hold enough pan juices throughout cooking, say for a large steak? Thank you, I love the design and the thermometer! Thanks for your great questions. Yes the lid is detachable and all pieces (excluding the thermometer) are dishwasher safe. The reservoir should be sufficient for most steaks but if the steak is very fatty your may have to remove some of the juices with the mini-baster that is included. The dimensions are approx 12.5" in diameter and about 5" high with the lid. Used on gas elements? And does it come with recipes or cooking/baking ideas? Yes it can be used with any cooking fuel/surface including the grill! A recipe book with baking recipes is included. Is there a recommended maximum heat? My grill gets VERY hot. Can this "Take the Heat"? The maximum heat would be 600F which you should be able to regulate using the grills lid. There is no need to use the Oplancha lid on a grill if you are using the grills lid. Because the Oplancha heats up so quickly, at most use Medium on your stove top. This all-terrain, stainless steel griddle and lid set works in ovens, over stovetops, even on grills—and its durable build is Made for a Lifetime. We like how versatile this cooking tool is. You can braise meat or fish to perfection in minutes. Or cook up a pizza. Or bake a delicious dessert. The heavyweight base retains heat while the lid captures it, so you can grill, smoke, steam, or bake indoors or out. 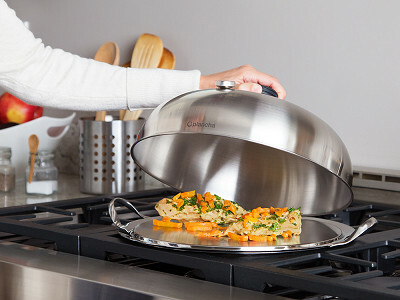 From stove to table top, the Mastrad O’Plancha shows careful attention to detail. 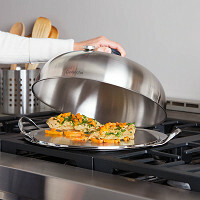 The ridges at the edge of the plate collect excess cooking juices, the rimless design makes it easy to turn food over on the surface, and the lid will keep food warm until it’s served. There’s even a built-in thermometer to keep tabs on the temperature inside.